Bélisaire, by François-André Vincent (1776). 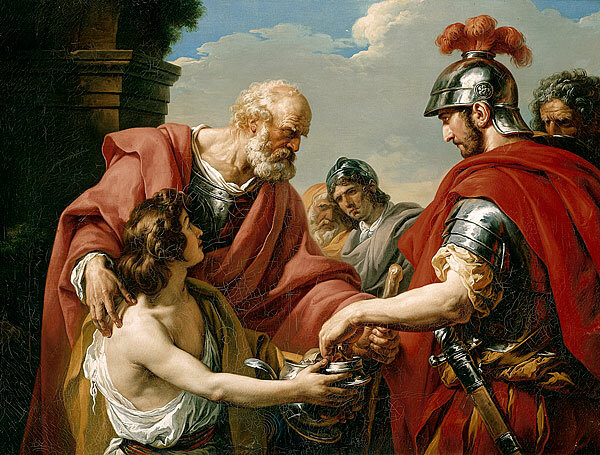 Belisarius, blinded, a beggar, is recognised by one of his former soldiers.(Wikipedia). 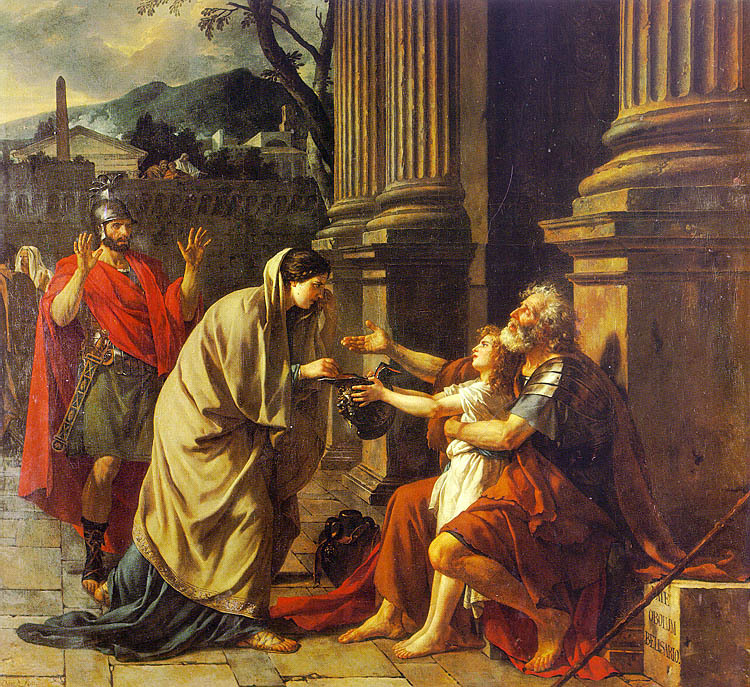 Belisarius Begging for Alms (1781) by Jacques-Louis David (Wikipedia). After listening, I have additional question. How manny people could read in Byzantimu empire? I.e. not just in the city but average number. There’s obviously no way of answering that accurately. But I would guess it was something like 1 or 2% of the population. Maybe a slightly higher number of people could read and write a little for the functions of their trade or profession but wouldn’t have been able to read a book. I’m just catching up to this podcast now and am only at episode 8, but I really wish I could have shown you this website: http://geacron.com/home-en/?&sid=GeaCron543854 at that time. It would have solved so many issues with mapping the ever changing geopolitical situations you’re moving through since it shows the whole world every year. It of course has a few bugs and inaccuracies, but no major ones that are relevant to this podcast. Thank you Patrick for sharing this link. What a great resource! Great Job Robin ! Keep up the good work. > We have copious historic records about Greece, but there are still some questions. The most mysterious episode in Greek national history takes place at the end of the Roman period. The Greek world was part of Rome, but Greek culture survived under Roman rule. Greek was the language of the earliest Christian gospels. The eastern half of the Roman Empire was culturally Greek and survived as the Byzantine Empire until 1453 AD (or CE, Christian Era). Between 600 and 800 AD, Slavic invaders washed over Greece as far south as the Peloponessus. These “barbarians” created a “dark age” in the Balkans during which written Greek records cease. In 800 AD Greek written culture reappears. Apparently these “invasions” can also be characterized as an intermingling of peoples. Greek civilization seems to have survived in small cities, and ultimately the newly arrived Slavs became Hellenized. Are we then dealing with the same Greek identity? It persists in a cultural sense, but the 19th century notion of “blood” might say that these are not quite the same people. This is worth keeping in mind later as one wrestles with questions of ethnic identity. I am Czech, so I have some understanding of the European history, but all my life I have considered Greeks as a rather isolated strange piece of nation sui generis. This history of Balkans seems to move them firmly into the Balkan history. Without restoring to the panslavic nonsense, I now wonder whether at least genetically (if not culturally), actually I am not closer to the current Greeks than they are to Socrates. Is there more about history of the Greece in the Byzantine times? During whole this time it looks like behind the Thessaloniki there was a huge hole where nothing happened. Was it so? I wouldn’t take his lecture seriously, as he tries to include and interweave the quite modern notions of racial purity and national identity in the medieval world, and then only apply it for the Greeks.